It's that time of year again. There's so much to love about fall...cool weather, baseball playoffs, crockpot dinners, hoodie sweatshirts, pumpkin patches. So on and so forth. It's my favorite season of the year by far. But, it's not perfect. There's the one big thing that always comes, always stands in the way, the one thing I cannot avoid or shake no matter what. Pity me. It's man cold season. Starting around now, and ending sometime in April, I will almost always have a cold, or at least some semblance of one. The sneezing, the cough, the congestion....you know what I'm talking about. Between now and Easter I'll probably guzzle a pallet of DayQuil. No matter what, though, I can never shake it. 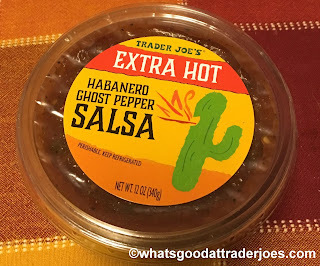 But I maybe have a secret weapon now: Trader Joe's Extra Hot Habanero Ghost Pepper Salsa. This may be a bit premature, but I may be cured only about 8 days into man cold funk season, all thanks to this super spicy salsa. The cactus on the package has it right - this is some fiery sauce. I will admit, I was a little scared to try it. But once I did, the sinuses cleared. The head unfogged. Even the cough went away. Musta been burned out of me. And it's stayed out. The salsa doesn't smell too intimidating, with an almost more chipotle kind of essence than anything else. It's almost enough to lull you into a false sense of safety, as the heat kicks up right from the first bite. 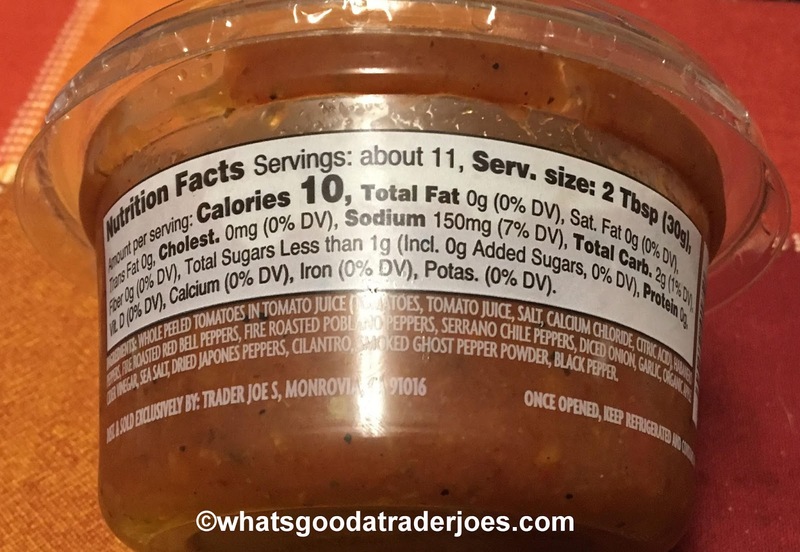 It's not upfront - since it's refrigerated, the physical coolness of the salsa kinda tempers it a bit - but right as it's going down the hatch, the spice ramps up. Pure heat - enough to make you cough or have your eyes tear up. But the thing is, unlike some spicy fare, the heat doesn't seem to build and build with successive bites. Instead, it plateaus from the start - granted, a pretty high plateau. Which is a good thing, as it makes it much more snackable than the salsa would appear at first bite. Aside from the habenero and ghost peppers, there's plenty to like. There's a very fresh feel to the salsa overall, almost as if it were almost homemade. It's not quite chunky, but not quite smooth either. There's some tomatoey sweetness and a little garlic and some other bits of flavor here and there, but even with the spice, it's not enough to completely overpower your food. That being said, I'd advise using sparingly. 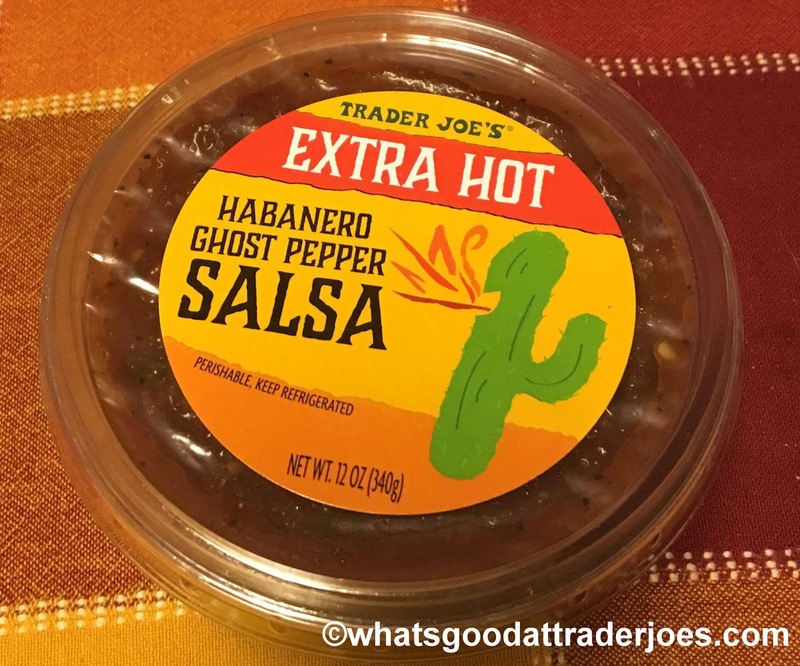 Both Sandy and I enjoy the super hot salsa enough to make this a probable repeat purchase, especially if it can keep those cold symptoms at bay. Look for the tub in the refrigerated section, and if I recall correctly, it's about 3 bucks. Cheaper and tastier than DayQuil, for sure. As someone who likes stuff hot, I was pretty disappointed by the heat levels on this, but I enjoy the taste quite a bit. Was hoping my first container was maybe just a dud, but number two was similarly disappointing. I probably wouldn't feel so let down if their ghost pepper grinder wasn't so damned good (but seasonal and expensive). do you take apple cider vinegar? I swear it helps keep me healthy all winter. I pour about one TB in a shot glass and add the juice of half a lemon and a tiny splash of water and knock it back. If nothing else it certainly will wake you up first thing in the morning!! It would probably be awesome mixed with some sour cream and guacamole to make a quesadilla. I love spicy food so this is up my alley.